If you think Jamaican folk tales are simple fairy stories that no one could possibly take seriously, you'd better think again. It's easy to say "this can't be real" when you're not in our neck of the woods. But just try walking around the country parts of Jamaica on a pitch black night - it might change your perspective! 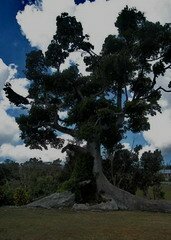 And while you're at it, you may want to explore the roots of our giant cotton trees - well known hang out spots for spirits of every description. Some Jamaican folk tales are taken more seriously than others. Some supernatural creatures, such as Duppies and Rolling Calves are widely believed in, or at a minimum, speculated about by many. Other aspects of folklore such as Anansi stories and Big Boy stories, are taken as pure fiction, and are told just for fun. Here is a taste of Jamaican folkore. To believe or disbelieve is entirely up to you. A duppy is a restless spirit. Good duppies are usually deceased family and friends who "dream you" (appear to you in a dream), in order to give advice or information. Bad duppies are able to do harm, and can be set on someone by using obeah. Duppies talk in high pitched, nasal voices. You may be in the presence of a duppy if your head feels like it is growing, or if you feel an unexplained heat affecting your body. Eating salt will help you to run (chase away) a duppy, as duppies despise salt. You can also run a duppy by wearing your clothes inside out, or shame a duppy by cursing or exposing your private parts. A well told duppy story can make the greatest skeptic get coldbumps (goosebumps). I got cautioned one night not to pick up any women in white dresses along a certain dark stretch of road, as a duppy had been plaguing the taximen in that vicinity. She would get into your vehicle, and your head would start to grow. Look around, and she'd be gone! If you didn't stop to pick her up, she'd still try to get in through cracks in your window. Now I'm not saying I believed, but it was really dark. Although I'm female, and don't drive a taxi, I rolled my windows up tight and drove straight home! Most Jamaicans believe in duppies, or at least in the possibilty that they do indeed exist. Be careful how you stroll around the Jamaican countryside at night, because you really don't want to meet a rolling calf. A huge, calf-like creature which rolls along the road, blocking the way of night-time travellers, and chasing them with a wicked intention. It has blazing red eyes that gash fire, and a chain that it drags behind it, making an unnerving clanking noise. To escape a rolling calf, the victim can do a number of things - drop objects for it to count (most supernatural creatures in Jamaican folklore can be escaped in this way), get to a cross roads (road junction) before it, open a pen knife and stick it in the ground. A rolling calf is also terrified of being beaten with a tarred whip held in the left hand. Rolling calves are always male. They are believed to be the spirits of people (particularly butchers) who were wicked and dishonest during their lifetimes. Ol' Hige is a witch who sheds her skin and flies by night, assuming the form of an owl. She harms people by sucking out their breath while they are sleeping, and is especially dangerous to babies. Ol' Hige's habit of shedding her skin leaves her vulnerable. If you discover her skin, you merely need to put salt and pepper on it. She will be unable to put her skin back on because it will burn her too much. Without her skin, she can be killed. Babies can be protected from Ol' Hige by placing an open Bible in their cribs, or by using certain charms. Of West African origin, Ol' Hige is not confined to Jamaican folk tales, although she may be known by other names. In Trinidad she is called "Sukuyan". River Mumma is a female water spirit who guards the source of many of our rivers. She can sometimes be seen sitting in the river, combing her hair with a golden comb. She sometimes leaves her comb on a rock, to entice victims whom she then draws into the water. In the days of slavery, sacrifices would be made to the River Mumma in times of drought, or when someone wanted to cross the river she was guarding. The fish in that location would not be eaten, as these were thought to be her children. The River Mumma is often associated with the legend of the Golden Table, one of the popular Jamaican folk tales. A table of pure gold lies at the bottom of certain rivers, usually at the river head (source). It rises briefly to the surface from time to time, particularly at midday, affording a glimpse of its golden beauty. The sight of the table mesmerises whoever sees it, and they become obsessed with the desire to obtain it. Efforts to procure the table end with disaster. The river eventually claims the lives of those who try to remove the table from the water. This legend is one of the Jamaican folk tales that probably arose from the quest to find gold when the Spaniards first came to Jamaica. In addition to our folk tales, there are many interesting Jamaican traditions associated with birth and death, as well as wide variety of unique Jamaican customs and beliefs.